February is the month for baking extra special Valentine’s desserts. My mom used to quip that the quickest way to a person’s heart is through his/her stomach. This sentence is not poignantly romantic or poetic, but is Oh so true. My mom was exemplary in her gift of hospitality. Growing up in Lebanon, we never knew who was going to be at our table for mealtime. Drop-ins were not unusual, but the norm. 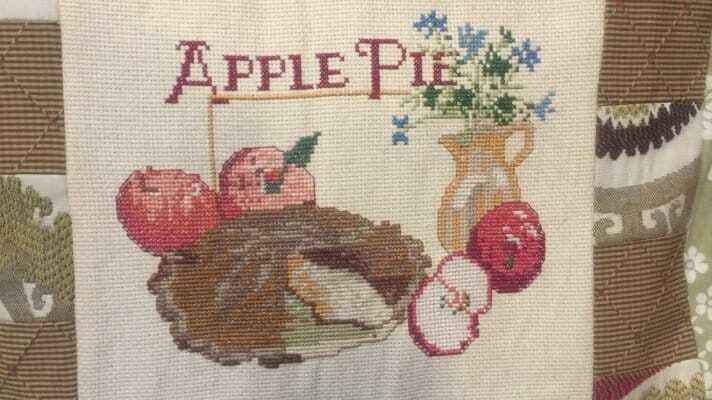 One dish she was known for was her apple pie; so much so that I cross stitched a pillow for her, commemorating and lauding her celebrity chef status as the best apple pie baker! She told me a story once about an apple pie experience that took place when she and daddy were first married and living in a village in Palestine before it became Israel. Dr. James Cauthen, the then president of the Baptist Foreign Mission Board, was coming for a visit. Mom had baked an apple pie on her primitive primus stove with its adaptive ingenious cover that turned this one burner contraption into a make-shift oven. All was going well through the meal until dessert. When mom sliced into the crust, she noticed that the apple filling was a bit runny but chalked it up to extra juicy apples. Then in horror, she recognized the grimace on Dr. Cauthen’s face as distaste. She discreetly took a nibble of her own famous pie and immediately recoiled. In her excitement of cooking for a distinguished guest, she had inadvertently forgotten an essential ingredient, sugar! Over what life catastrophe do you need to pass the sugar bowl? Many years ago a friend had a bunch of seminary students over for homemade ice cream. We were so excited. Immediately upon tasting, there were many grimaces. She, too, had left out the sugar. What makes us gracious hostess is what we do in the middle of such disasters. I prefer morphing it into a funny story and not take myself so seriously! I have tasted that famous apple pie. It was very delicious. I loved the story of the sugarless pie and the clever solution. It’s been amazing hearing about how far-flung mom’s apple pie has reached! The older we get, the more we realize how wise our mothers were. Glad you enjoyed the story, especially since you knew my parents from way back when. Your father and my father were running around buddies when both of them were in their twenties. That in itself is pretty astounding!